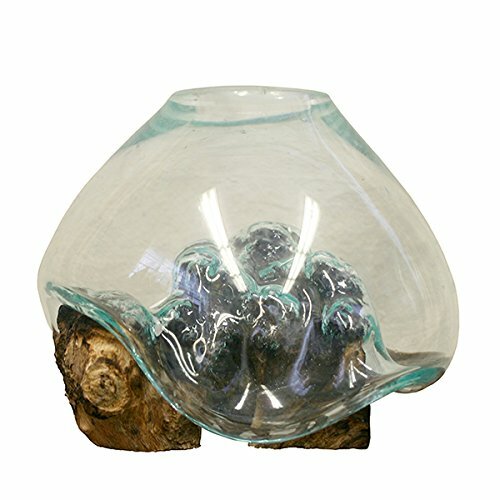 We have several sizes of these Molten Glass and Wood Root Sculptures, this being our small. (Other sizes are listed below).. But we can assure you, it not small in style and features This, one of a kind, unique piece began with a piece of a wood root and then a skilled artisan, who has a love and an eye for the art of glass blowing, begins blowing the molten glass onto the shape of the root and the glass begins to flow and cradling the form of the wood, until the artisans makes it into a glass vessel that can be filled with items of your own imagination. No two pieces are alike because of the variances in the wood and we can only show you a picture of what some have looked like and you get a bit of a surprise, and delight, when yours arrives. The hand blown glass is made of 100% recycled materials. The bowl can be used as a terrarium or a vase, and some like to use it for a fish bowl. It is also great as a candle holder Wherever or however you put this wonderful piece in action, you are going to receive rave reviews. The bowl will come wrapped on top of the wood root, just unwrap it and place it onto the wood and it will fit right in place. Overall size of this piece is 7" tall x 7" wide. In some units, it can be a bit larger due the variations in wood and glass. Also available and sold separately: Mini Hand Blown Molten Glass and Wood Root Sculptured Terrarium / Vase / Fish Bowl, Medium Hand Blown Molten Glass and Wood Root Sculptured Terrarium / Vase / Fish Bowl, Large Hand Blown Molten Glass and Wood Root Sculptured Terrarium / Vase / Fish Bowl and Hand Blown Molten Glass and Long Length Wood Root Sculptured Terrarium / Vase / Fish Bowl.